Maybe you have heard these medical terms before. Possibly one of these labels has been applied to you or your spine. Or simply, Spinal Degeneration. It’s all the same. The prefix ‘ARTHROS’ means JOINT. The suffix ‘ITIS’ means INFLAMMATION. So ARTHRITIS literally means JOINT INFLAMMATION. A joint is anywhere in your body where two bones come together to allow for motion. Think of your elbow joint or your shoulder joint. These joints allow for your arms to work properly. Your spine is made of numerous joints where spinal bones and ribs interact with each other. Spinal joints allow for a wide variety of movements. Because of the significant mobility in the spine, however, a lot of potential for injury exists. The problem with many diagnoses is that often they aren’t very helpful. In many cases a diagnosis is just a label that doesn’t help us determine the cause of the health problem. For example, knowing you have ‘arthritis’ doesn’t tell you what has caused the condition or, most importantly, what steps are required to correct it. Understanding the cause of a health problem is critical in addressing it effectively. How can you resolve a problem permanently without knowing what caused it in the first place? Your spine needs to be flexible and have a good range of motion. The movement and flexibility of your spine allows you to bend, rotate, extend, flex—basically live an active life on top of performing the most essential movements of your daily life. When your spine becomes misaligned, fixated or locked out of alignment it loses some of its ability to move. This lack of mobility will cause your spinal joints to inflame and in time wear down or degenerate. Degeneration is your body’s response to the injury. Your innate intelligence will deposit more bone at the damaged spinal area to stabilize the injury. This type of wear and tear can be seen on spinal x-rays. This is one of the reason why spinal x-rays can be a critical aspect of examining your spine and understanding how to best help you. This degenerative process takes time, so often; spinal decay is a sign of long-term misalignment damage. This is a side-view x-ray of the cervical spine. 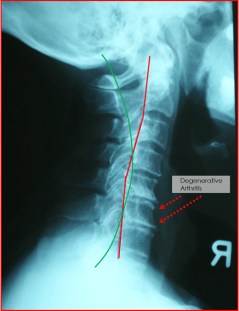 The green curved line represents the ideal alignment of the neck. This curve needs to be present from very early on in life and continue on throughout this person’s life so they can be as healthy as possible. The red line shows the misalignment or subluxation present in this person’s spine. We are seeing a forward kink in this example. 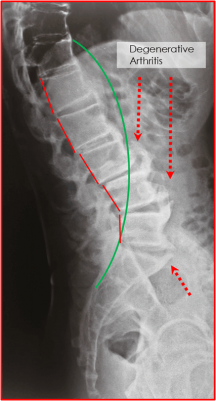 The arrows are pointing to significant spinal degeneration. This person’s body has laid more bone in the misaligned area to strengthen and stabilize the injured joints. Spinal misalignment and the loss of movement in the spinal joint are the causes of the spinal degeneration. It was not caused by aging, and it is clearly not normal for this to happen to anyone. The spinal decay usually does not cause pain directly. It is the effect of a deeper problem: the long-term subluxation. Spinal degeneration can be a complicating factor, but it is rarely the cause of spinal pain. This is a side view x-ray of the lumbar spine. Again, green is good, red is bad. The red lines show the very severe misalignment present in this person’s lower back region. In this case, this person’s lumbar spine was shifted backward and locked out of place. They were also experiencing chronic low back pain and numbness into their right thigh and leg. They had to give up tennis and going to the gym and they were less productive at work as a result of the pain. Their spine was so severely damaged, because it had been out of alignment for many years. This is a gradual process that may start without any pain. And that was the experience of this person. By the time pain hit, this person’s medical doctor termed their spinal degeneration, a ‘bone spur’. But unfortunately, the medical doctor did not explain the cause of their pain, and gave them repeated cycles of pain-killers without addressing and correcting the cause. The pain and symptoms continued to worsen until they finally had enough of dealing with these problems, and had their spine checked by one of our Doctors of Chiropractic. We were able to locate the spinal misalignment that was affecting their life, and accept this person for chiropractic care. Due to the long time-frame through which the misalignment and degeneration had progressed, it took considerable time and effort on all parties involved for the healing process. But we saw great improvements not only in their health but their general quality of life. If you are dealing with spinal pain and/or have been diagnosed with spinal degeneration, then schedule a spinal checkup to see if chiropractic can help you. Not all types of spinal decay is caused by spinal misalignment and joint dysfunction. That is why a spinal checkup has to be your first step, to see if you need to be adjusted. Chiropractic adjustments are physical movements that realign your spine. Chiropractic adjustments improve the flexibility and movement of your spine. Adjustments also remove pressure on your nerves. Thus, improving the performance of your entire body. There is no reason to continue dealing with spinal pain and health problems. Chiropractic has a long track-record of helping people with many types of pain, symptoms, and health challenges.